Moving between work (and play) locations often involves changing various system settings: wireless networks, printers, and more. MarcoPolo—named for the kids’ call-and-response game of finding other people—susses out your location in order to change dozens of aspects of what your computer is doing or showing. As with NetworkLocation, the goal here is to automate the process of switching key configuration options—no more hunting around in ten different preferences windows each time you move between, say, your office and a favorite coffee shop. To configure MarcoPolo, you create and name your contexts (your physical locations), choose evidence sources (the things the program should monitor), define rules (triggers that engage actions), and set up actions (the behaviors or settings to change). Options for evidence sources include straightforward criteria such as the time and whether a laptop is operating off AC or battery power; parameters such as the USB identifiers for connected devices, a display’s model number, and paired Bluetooth devices; very specific items, such as the rather-technical Bonjour names for services on the local network; and even ambient light (measured using the sensor present on some Apple laptops). For example, you could have MarcoPolo monitor your power source, and when on battery power, automatically switch to a context that mutes audio, turns off Bluetooth, and initiates a VPN connection. Actions can typically be set both when “arriving at” a location and when “leaving” it (in the latter case, to restore settings to a previous state). 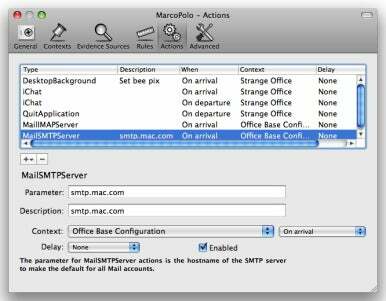 As with NetworkLocation, you can also use MarcoPolo to quickly change multiple settings on a machine that stays put. For example, if MarcoPolo sees that it’s past 8am on a weekday and my computer’s audio isn’t muted, it can automatically switch to my “Office Morning” context, which sets iChat status to Drinking Coffee and uses AppleScript to check for new e-mail and launch the programs I commonly use for work. Actions appear in a list that doesn't automatically group them by the Context (location set) to which they belong. Also, actions are displayed in a list but they aren’t grouped into Contexts. Since you can rearrange the list by dragging actions up and down, at times it’s not entirely clearn what, precisely, will happen when changing contexts. But MarcoPolo’s biggest weakness is in not allowing a Wi-Fi network’s name to be used as a criterion; you can specify a wireless access point only by its unique number (its BSSID, incorrectly noted in the program’s interface as its MAC address) or the network name (SSID). Taken together, these limitations make MarcoPolo more appropriate for those who find NetworkLocation too limiting in what criteria can be used to determine your location.